I always try to come up with new and fun ways to stimulate my son by engaging in an activity with him. I saw a fun activity online that involved cocktail sticks and marshmallows and the purpose was to create a structure as well as having fun. 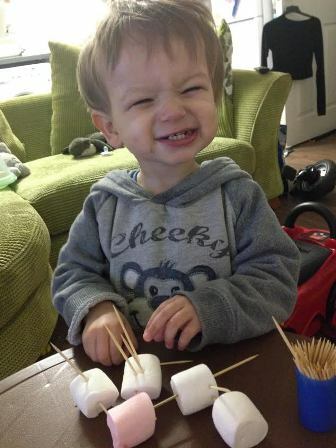 My son is 23 months old and he enjoyed every moment whilst playing with the marshmallows but I think he enjoyed tasting the marshmallows the most. This activity cost me only £2; I bought the cocktail sticks and the marshmallows from Poundland.